ECO RainÂ® Root Zone Irrigation Mat is the latest development in sub-surface irrigation technology. ECO Rain® Root Zone Irrigation Mat is the latest development in sub-surface irrigation technology. It provides a source of water to the root system while giving total coverage of the entire area to be irrigated. ECO Rain® Root Zone Irrigation Mat is a sub-surface irrigation system that uniquely provides an even distribution of water to the root zone of the vegetation to the entire area. 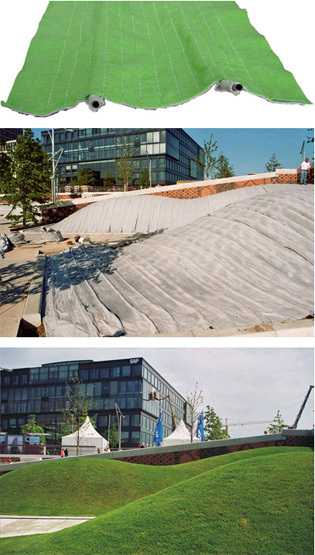 This patented system consists of two layers of geotextile mat, 800mm wide, encasing a drip line which is fully wrapped in the geotextile. A recent project in Germany used grass as a noise dampener in between the tracks of a tram system. Conventional irrigation systems could not be used in this electrified area so therefore ECO Rain® was the chosen system. Test fields in Abu Dhabi have compared the ECO Rain® with conventional pop-up sprinklers and standard drip line systems and the results have indicated water savings of up to 60 per cent are achieved with ECO Rain® when compared with the sprinkler system. This product was granted the “Innovation” Award at TechTextil 2007 in the category of New Products. Images (top to bottom): ECO Rain® Sub-surface irrigation mat; during installation; and after installation.